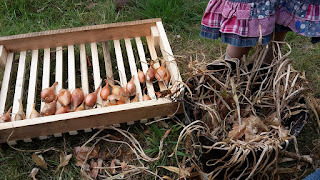 This year I hadn't gone mad with alliums, instead I'd concentrated on the higher price tag veg like garlic and shallots, in fact I hadn't grown any onions but I do have a full bed of leeks looking like they're ready for winter and going to taste amazing! So on Tuesday I sat down and actually sorted through what I'd grown and got it ready for storage. Something I should do straight away, not months after, but didn't have the time to when I harvested. I was really annoyed at myself while I was doing it, there was some garlic that had gone mouldy because it was left at the bottom of the stack, that's wasted food that I'd spent time, space and effort growing. garlic sorted ready for storage. 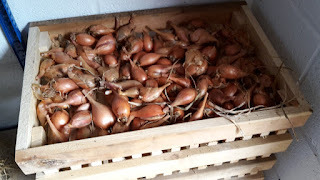 I also sorted through and cleaned up my shallots as well. I grew two different types and you don't need to be a horticulturist to tell them apart! The one batch were amazing, not a bad one in there and all looked beautiful (and they taste amazing as well, with a delicate flavour), whereas the other batch all looked dehydrated (I'm guessing from being dried in the greenhouse) and although still usable they just don't appeal in the same way. Stored ready for use over winter - although i know they won't last long! I need to make a real effort to spend more time looking after what I've grown, my main trouble is I'm always far too busy with my own paying work in the summer, something I need to take measures to alter in someway, working from home more and on site less I think. 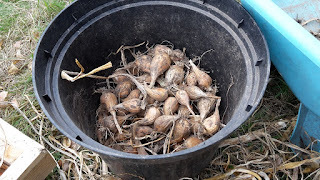 I've often said that the most important part of self sufficiency is food storage, because there's little point in growing it all if you can't store it to use when you need it. Alliums are a prime example of this, treat them right and you can have a supply all year round, take you eye off the ball, like I have here, and you'll be left with very little when you need it most. I'm now planning my harvest for next year and I'm going to order in all new stock for my garlic and shallots (although I might grow the shallots from seed instead) so that I'm not breeding on from a harvest I wasn't happy with. 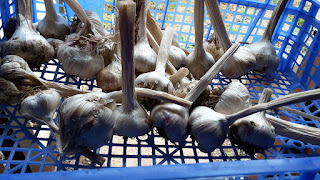 The rust problem I had alone has put me off using my own stock of garlic blubs/cloves let alone the storage problems. What alliums do you grow for storage over winter? 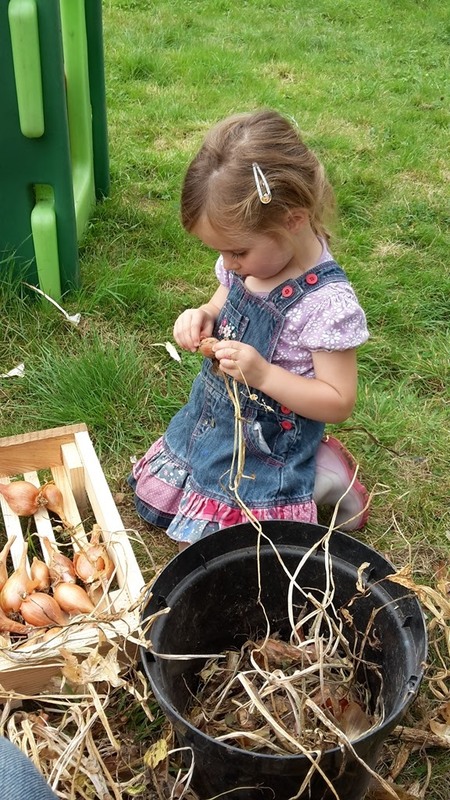 What is your favourite type of shallot and garlic to grow? Any tips for good storage with these crops? 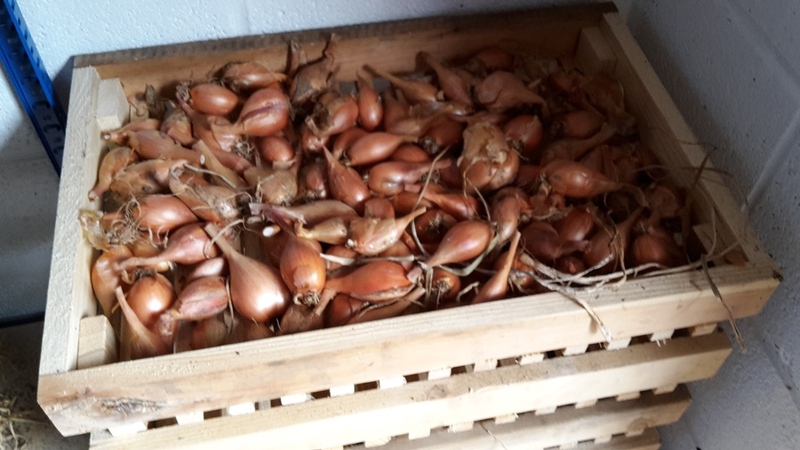 I didnt bother with shallots this year and just did onions garlic and leeks, they have all done brilliantly and yes its the drying and sorting for storage that takes time, I am buying in new stock this year for garlic and onions and next year may do a few shallots. I like the look kf the real seed catalogue shallots that grow well from seed. I might give them a go next year. 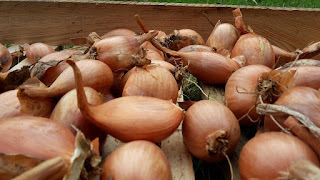 My shallots rotted this year....and frankly, I didn't miss them. The garlic I grow came from a local farmer's market 9 years ago. I just save back some to replant and every year they get more impressive. I have no clue what variety they are, other than they are a hard neck. Hard neck is the way to go - then you get scrapes as well, I get so excited about them! I like shallots because they seem to store so well. Next year I'm going to grow more of everything I think! what is the name of the variety that was good? Longor - I really like them, the taste is amazing when we have them roasted as a veg in their own right. Oops!! I forgot I planted shallots this year. They're still out there and I will have to check on them this weekend. I understand the issue of tending the harvest all to well. It came as a shock how little time would be left with a little one and I've sadly let a lot totally go to waste this year. Next year he'll be able to "help" without eating dirt clods and mulch so hopefully more will get done. 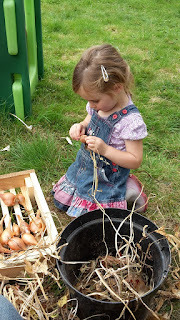 I've got some great tips for getting them helping in the garden - my girls love being out there. They've been out with me for two hours today and never moan. i forgot to harvest my elephant garlic this year, and that's quite costly to buy new cloves to replace it.